One of the most obvious effects of the Irish Revolution was the partition of Ireland into two parts; the essentially independent Free State in the 26 counties and the unionist-dominated autonomous region in Northern Ireland. The partition of Ireland left considerable minorities marooned on the ‘wrong’ side of the border and in the case of the area of study chosen by Fergal McCluskey, Tyrone, it was actually a majority who did not want to come under the jurisdiction of the government at Stormont. This makes McCluskey’s book quite different from the other county by county studies in this series, which are generally concerned with southern events and are punctuated by the familiar landmarks of the 1916 Rising, the War of Independence and Civil War. In the North in general and in Tyrone in particular this mental chronology is of little use. Events elsewhere are relevant but matters in the north western county on the whole had a different trajectory. This study of Tyrone tells a quite different story to those books focused on Southern events. The key dates here are 1912-14 when unionists armed to defy the Home Rule Bill and when the partition of Ulster was first mooted. The prospect of partition combined with the familiar pressures of First World War, Easter Rising and conscription conspired to shred the Irish Parliamentary Party and cause the rise of Sinn Fein, but unlike elsewhere the republican counter state ran into organised paramilitary resistance in the form of the Ulster Volunteer Force and above all the Ulster Special Constabulary – both unionist militias, one private enterprise, the other semi-state, to borrow modern analogies. The IRA military campaign never made a great deal of headway in Tyrone as a result. Like other parts of Ulster its most bloody period was early 1922 when the IRA attempted an on again off again campaign across the new border and the USC responded with increasingly indiscriminate reprisals on and general intimidation of the Catholic population. Following the fizzling out of the border campaign and the outbreak of the subsequent Civil War in the south, nationalists in Tyrone, whose middle class and clerical elite had abandoned the IPP and Hibernians in 1916-18 for Sinn Fein, returned McCluskey writes, to their former allegiance and made a grudging peace with the Stormont government. McCluskey’s book argues that unionists employed colonialist arguments and that the Unionist militias were far more indiscriminate that republicans in use of political violence. McCluskey has a number of provocative contributions to make to the small but growing scholarship on the Irish revolutionary period in the north. The first is that although modern unionist commentators like to frame partition in terms of Ulster Protestant self-determination, this clearly could not apply to majority Catholic and nationalist counties of Fermanagh and Tyrone which ultimately ended up in Northern Ireland. Rather, he argues, unionists in 1912 employed a self-consciously colonial and supremacist argument to either block Home Rule or at least exclude large parts of Ulster from it. What this amounted to was the argument that loyal British subjects’ voices should be held superior to disloyal (and sometimes termed ‘inferior’) Catholic nationalists. On top of that, they invoked a ‘contractarian’ argument by which obedience to government was dependent on that government upholding basic rights and liberties of the subject, something they claimed a Home Rule parliament (let alone an Irish Republic) would not do. In doing so, and in appealing to Protestant fears of ‘Rome Rule’ they managed to smother the traditional Presbyterian liberal tradition which even in rural Ulster in 1912 was still a considerable force. One Presbyterian moderator, Armour actively campaigned for acceptance of Home Rule in this period. The second argument is that while IRA violence in Tyrone was dominated by military style attacks, that of the Ulster Special Constabulary was dominated by reprisals and intimidation of civilians. He shows that around 100 people were killed or seriously injured in two years of political violence in the county; roughly half the casualties committed by republicans and half by loyalist or state forces but that two thirds of the Special Constabularies victims were civilians. This book is well worth a read though one may not agree with all of its arguments. A third provocative argument made here (echoing recent work by Kieran Glennon) is that the pro-Treaty authorities in the Free State from early 1922 were never really committed to the border campaign of that year and used it only as a ruse to weaken the anti-Treaty IRA. They then launched what McCluskey terms a ‘proxy war’ on behalf of Britain, destroying the anti-Treaty forces in the south and effectively copper-fastening partition. As ever the best course for the reader is to read the book and make their own mind up on these issues. However, it also falls on the reviewer to take up some of these points. It is true that unionist arguments in 1912 did not rest on democracy or self-determination (as they largely do today). Rather they rested on how illegitimate it was to take away their rights as Imperial subjects, however small a minority they may be. McCluskey’s point is convincing. However taken in context this is not terribly surprising as the United Kingdom was not a democracy as we would understand it at all at the time. Rather the vote was held by property owning tax payers (around 30% of the male population in Ireland though up 60% in wealthier Britain). Before universal suffrage in 1918 it was not considered at all outrageous to declare that elite minorities were more important than majorities – indeed the attempt by the unionists’ allies in the Conservative Party to retain the House of Lords’ veto, not only over Home Rule but also over the ‘People’s Budget’ hammers home the point. IRA violence in the border counties had the potential to be sectarian and directed at civilians too, despite its non-sectarian ideology. On the nature of violence in the north, it is clear that republicans felt their enemy was the British state whereas unionists saw theirs as not only ‘rebels’ but disloyal Catholics as whole. However the disproportion in violence and intimidation against civilians is to my mind a little overdrawn here. The IRA systematically raided unionist homes all along the border region in mid-1920 in search of arms, shooting some who resisted. From an IRA perspective this was a legitimate military operation but it does not take a great leap of imagination to see how unionists could perceive it as an attack on their community. There is a case to be made for the IRA protecting the Protestant community south of the border from robbery and reprisals in early 1922, but it is also the case that, perhaps not in Tyrone but certainly elsewhere, for instance in Belfast and South Armagh/South Down, the IRA deliberately killed Protestant non-combatants in reprisals. Thirdly on the Provisional Government (especially Michael Collins’) sincerity in supporting the IRA northern campaign in early 1922; the thesis that it was a cynical ruse is certainly a plausible possibility but it also seems possible that Collins was simply desperately trying to keep up with events and was flitting from policy to policy at regular intervals as seemed best to him. There may have been more indecisiveness and muddle than conspiracy in other words. This is the second book in this series we have reviewed and like the first on Sligo it is well worth reading. There are in my opinion disadvantages to studies being limited by county boundaries but they do also threw up useful local manifestations of the national struggle for independence. Written by: John_Dorney on 29 July, 2014.on 30 July, 2014. 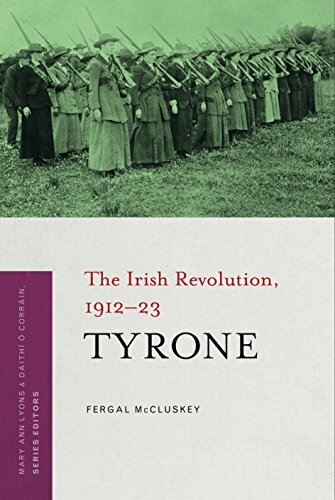 3 Responses to "Book Review: The Irish Revolution: Tyrone 1912-23"
I’d like to buy this. I agree with your comment on limiting studies to county boundaries. In all parts of Ireland society is shaped by intercommunal networks that stretch across boundaries and man-made defining zones. This is why the effects of partition in the early decades of the twentieth century is so crucial. I am familiar with some of McCluskey’s work and look forward to reading this when I get a chance. That’s absolutely true John. Even Cork and Kerry the cockpit of guerrilla warfare in 1920-23, have to my mind suffered from being studied and portrayed as separate units because in reality IRA units from both counties routinely cooperated across county lines both in the War of Independence and the Civil War, likewise their British and FS enemies. It’s even more problematic in the border region. And thirdly the counties are not of equal size and population, thus it makes no sense comparing say Cork to Leitrim or Louth in terms of statistics.